VANCOUVER—The line was 30 deep before 6 a.m. at the Venezuelan consulate in downtown Vancouver, the only location in western Canada for ex-pats to vote in their presidential election Sunday. By noon more than 600 Venezuelans had stood in the short hallway, marked the labyrinthine bingo-card-like ballot and dipped a pinky tip in a well of blue ink on a wooden stool. By mid-afternoon, hallways and staircases were littered with voters checking smart phones for exit poll data back home showing a tight race between Hugo Chávez and the strongest opponent he has faced during his 14-year presidency, a charismatic lawyer named Henrique Capriles. She paid $400 to fly from Calgary to Vancouver for the day, just to vote. So did her friend Yelitza Bitter, a fellow project controls expert working for the energy giant Suncor. Beside them was Noris Carrillo, who works in business and planning for the energy company Nexen. Her thousand-mile voyage from Fort McMurray, the remote boomtown at the heart of the oil sands, set her back about $1,000, she said. For all three women, and the other 600 or so Venezuelans who elections organizers estimated made the trip from Alberta, it was their second such journey this year; they all had to come to the consulate to register in the spring. Ostensibly this meant two epic round-trips each for the privilege to cast a single vote in an election that would require close to 8 million votes to win. Like many Venezuelan ex-pats in Alberta, these women all had worked for PDVSA, had marched against Chávez and had been fired via mass media. “Every day, you would check to see if your name was in the paper,” Bitter said. The bulk firing “caused divorces, suicides. People didn’t know what to do.” She and her family coasted on savings for two years before emigrating. When she left Venezuela in the winter of 2004, she said, the temperature at home was 30 degrees Celsius. When she landed in Canada, it was minus-40. (Fahrenheit difference: 120 degrees.) Yet Canada, a nation of immigrants loosely tasked with extracting natural resources and shipping them abroad, made her feel at home. Albertans made up a decidedly pro-Capriles contingent. Asked whether anyone had ever voted for Chávez (he first ran in 1998), they balked. “Some people voted for him thinking he was somebody different,” Bitter said. “He was different!” Lozada replied. “Different in a bad way,” Bitter acknowledged. As the votes were being counted at the consulate, people congregated at a nearby Hyatt and waited for results. 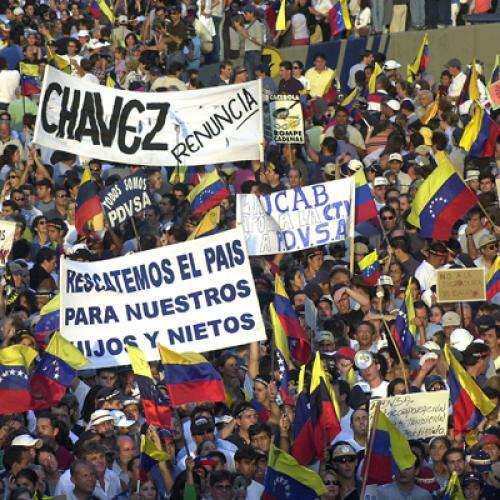 At around 8 p.m. on the West Coast, word trickled in from Venezuela: Capriles lost handily. In the concourses, men crowded around cell phones that blared tinny Spanish-language news reports; in the hotel lounge, women wept openly. The incumbent carried Venezuela 54 percent to 44 percent. The totals in Vancouver showed a different slant. Of the 776 votes cast there, including those by consulate staffers, Chávez received 14 votes. Sam Eifling is an American journalist in Canada. On Twitter he’s @sameifling.